Esplanade frontage on the Bay. Urangan Motor Inn and Pier Restaurant is conveniently located on the Esplanade at Urangan, Hervey Bay. Situated opposite the calm waters of Hervey Bay and the Urangan Pier, which stretches 800 metres into the bay towards Fraser Island, the motel is perfectly placed for that quiet getaway. From Brisbane CBD and Brisbane Airport. Follow all roadside directions that guide you to the Sunshine Coast via Bruce Highway. Head north on the Bruce Highway for around 3 hours until you see the Maryborough exit. Turn off the highway and travel through Maryborough following signs to Hervey Bay. At the first roundabout (approximately 20 Kilometres out of Maryborough) take the third exit and follow the signs to airport. Continue along this road you until you reach the Esplanade at Urangan. Turn right at Vic Hislop’s Shark & Whale Information Centre and continue for 130m. 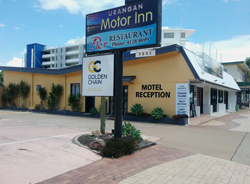 The Urangan Motor Inn will be on your right with the motel entrance between the Pier Restaurant and Bakery. Turn left off the Bruce Highway into Maryborough and proceed as above.